Are you still looking for the best scheme operator incentive? Do you know that so many factories are taking benefit of the incentive system on every day? I have recently visited a factory that has implemented preperformance-based incentive scheme for their sewing operators (salaried operators), line supervisors, quality checkers and floor in-charges. Within a time span of six months company just doubled their monthly production with same manpower and other resources. how the factory did it? what all benefits factory is experiencing by implementing incentive system? The Company is situated in National Capital Region (NCR) of India. Under product profile company makes ladies top with a lot of machine embroidery as well as hand embroidery work. Most of their sewing operators are migrants from other parts of the country. And most of them live far away from the factory location. The company provides a shuttle bus for the commuting to work. The company implemented incentive in a floor of 350 sewing machines. Number of operators reached the target efficiency and earned lump sum amount weekly. Above all factory saves lot of money after the successful implementation of incentive scheme. An operator produces more than the target. By reaching target efficiency operators earns a lump sum amount as jump bonus. Secondly, for each extra efficiency percentage after target efficiency, operator gets straight bonus. Operator incentive scheme is also linked with attendance of the operator. Like, if an operator works less than 5 days in a week will get no efficiency bonus. The incentive payment is made weekly basis. To provide the correct amount of incentive, operator’s individual production is captured and daily operator wise efficiency is calculated by engineers. It was a very difficult task to measure the correct efficiency of each individual (operators) by manual data capturing. This factory installed a new technology, RFID based shop floor production monitoring and control system that helped engineer to measure real time performance of operators. This real time production tracking system also provides a display device to each workstation on which operators can checks their day's production and total efficiency. Operator can even see their bonus amount earned on the display device. Even this software itself calculates operator’s weekly incentive earnings based on the above criteria. 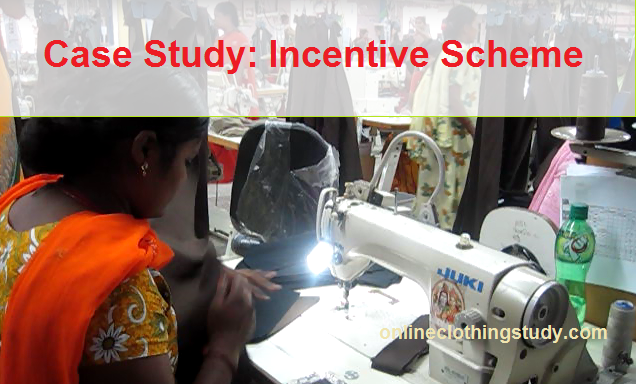 A case study of sewing operators incentive scheme in the apparel industry.